Ghiyath al-Din Abul Fateh Omar Ibn Ibrahim al-Khayyam was born at Nishapur, the provincial capital of Khurasan around 1044 A.D. (c. 1038 to 1048). 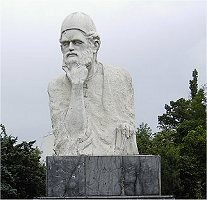 Persian mathematician, astronomer, philosopher, physician and poet, he is commonly known as Omar Khayyam. Khayyam means the tent-maker, and although generally considered as Persian, it has also been suggested that he could have belonged to the Khayyami tribe of Arab origin who might have settled in Persia. Little is known about his early life, except for the fact that he was educated at Nishapur and lived there and at Samarqand for most of his life. He was a contemporary of Nidham al-Mulk Tusi. Contrary to the available opportunities, he did not like to be employed at the King's court and led a calm life devoted to search for knowledge. He travelled to the great centres of learning, Samarqand, Bukhara, Balkh and Isphahan in order to study further and exchange views with the scholars there. While at Samarqand he was patronised by a dignatory, Abu Tahir. He died at Nishapur in 1123-24. Algebra would seem to rank first among the fields to which he contributed. He made an attempt to classify most algebraic equations, including the third degree equations and, in fact, offered solutions for a number of them. 'This includes geometric' solutions of cubic equations and partial geometric solutions of most other equations. His book Maqalat fi al-Jabr wa al-Muqabila is a masterpiece on algebra and has great importance in the development of algebra. His remarkable classification of equations is based on the complexity of the equations, as the higher the degree of an equation, the more terms, or combinations of terms, it will contain. Thus, Khayyam recognizes 13 different forms of cubic equatlon. His method of solving equations is largely geometrical and depends upon an ingenious selection of proper conics. He also developed the binomial expansion when the exponent is a positive integer. In fact, he has been considered to be the first to find the binomial theorem and determine binomial coefficients. In geometry, he studied generalities of Euclid and contributed to the theory of parallel lines. The Saljuq Sultan, Malikshah Jalal al-Din, called him to the new observatory at Ray around 1074 and assigned him the task of determining a correct solar calendar. This had become necessary in view of the revenue collections and other administrative matters that were to be performed at different times of the year. Khayyam introduced a calendar that was remarkably accurate, and was named as Al-Tarikh-al-Jalali. It had an error of one day in 3770 years and was thus even superior to the Georgian calendar (error of 1 day in 3330 years). 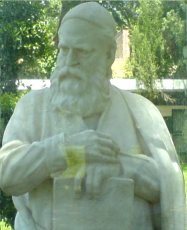 His contributions to other fields of science include a study of generalities of Euclid, development of methods for the accurate determination of specific gravity, etc. In metaphysics, he wrote three books Risala Dar Wujud and the recently discovered Nauruznamah. He was also a renowned astronomer and a physician. Apart from being a scientist, Khayyam was also a well-known poet. In this capacity, he has become more popularly known in the Western world since 1839, when Edward Fitzgerald published an English translation of his Rubaiyat (quatrains). This has since become one of the most popular classics of world literature. It should be appreciated that it is practically impossible to exactly translate any literary work into another language, what to talk of poetry, especially when it involves mystical and philosophical messages of deep complexity. Despite this, the popularity of the translation of Rubaiyat would indicate the wealth of his rich thought. Khayyam wrote a large number of books and monographs in the above areas. Out of these, 10 books and thirty monographs have been identified. Of these, four concern mathematics, three physics, three metaphysics, one algebra and one geometry. His influence on the development of mathematics in general and analytical geometry, in particular, has been immense. His work remained ahead of others for centuries till the times of Descartes, who applied the same geometrical approach in solving cubics. His fame as a mathematician has been partially eclipsed by his popularity as a poet; nonetheless his contribution as a philosopher and scientist has been of significant value in furthering the frontiers of human knowledge.